This course is designed for workers at your facility that must routinely enter permit-required confined spaces to perform some type of work. This course is designed to meet the training requirements of 29 CFR 1910.146. "Permit- Required Confined Spaces". Topics of instruction include duties of supervisors, entrants and attendants, lock out/ tag out procedures, atmospheric monitoring and non-entry rescue. This course is designed to meet the training demands of 29 CFR 1910.146 (k) and NFPA 1670. 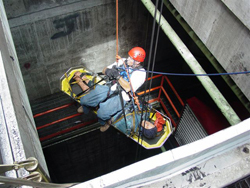 24 to 40 hours of intensive classroom and field instruction insures that your facility's confined space rescue team will be proficient in the basic skills needed to safely and efficiently perform entry rescues in your workplace. Topics covered in the program include assessment of confined space hazards, atmospheric monitoring, confined space rescue equipment use and limitations, knots, vertical and horizontal hauling, lowering systems, personal protective equipment and patient packaging. 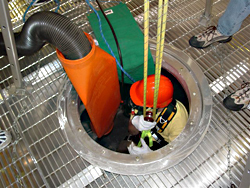 If there is one thing that is certain about confined space/ high angle rescue skills, it is if not routinely practiced, skill will be lost in a very short time. We do not allow our clients to build a false sense of security without proper confined space/ high angle rescue refresher training. These advanced skills need to be practiced at regular intervals in order to maintain proficiency. Designed to work hand in hand with annual training courses, 4 to 8 hours of quarterly refresher training is designed to keep your confined space/ high angle rescue skills sharp and ready. This 40-hour DOT/AMA certified course provides your facility's medical first responders with the skills needed to initiate basic first aid and CPR within a trauma patients "Golden Hour". It may also include use of the AED (automatic electronic defibrillator), which is gaining widespread notoriety for saving the lives of heart attack victims both on and off the workplace.